Hungarian statesman and journalist; born at Budapest Oct. 7, 1828. The straitened circumstances of his parents threw him at an early age upon his own resources. He gave private lessons, and was the first to translate into German the works of the great Hungarian lyric poet Petöfi (1843). He also translated into Hungarian the plays of Karl Hugo. Having embraced Christianity and obtained his degree from the University of Budapest, he went to Vienna to study, and when the Revolution of March, 1848, broke out he joined the students' legion, doing yeoman's service in the cause of liberty. He also contributed to the "Studenten-Kurier" and "Der Freimüthige." The outcome of the rising of October left Falk penniless and on the verge of despair. At this time he wrote an article for the "Oesterreichische Zeitung," advocating the restoration of the Hungarian constitution and emphasizing its importance for Austria itself. The article decided Falk's future career; he became a contributor to the paper and remained on its staff until it was suspended by the government. Falk then joined the staff of the "Wanderer." His articles were enthusiastically received in Hungary, and, with those contributed to the "Pesti Naplo," then the leading Hungarian paper, won him the recognition of Hungarian patriots. He was soon brought into personal relations with the great political leaders of the country, among them being Count Stephan Széchényi. His "Count Széchényi and His Time" is a memorable work. 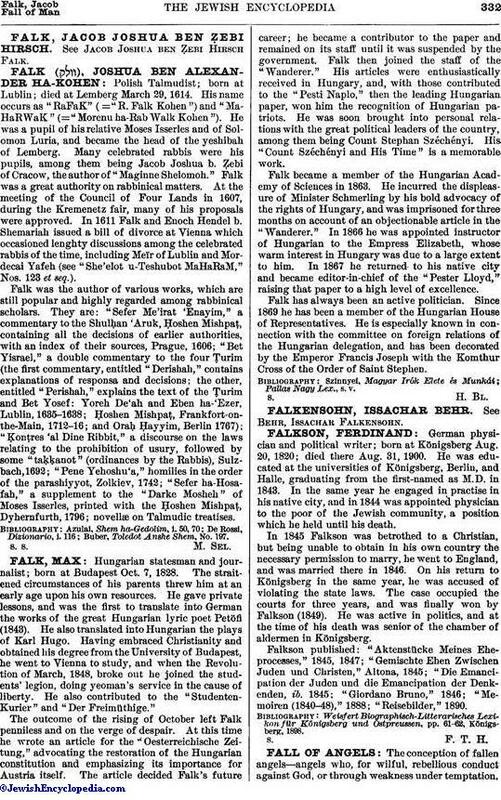 Falk became a member of the Hungarian Academy of Sciences in 1863. He incurred the displeasure of Minister Schmerling by his bold advocacy of the rights of Hungary, and was imprisoned for three months on account of an objectionable article in the "Wanderer." In 1866 he was appointed instructor of Hungarian to the Empress Elizabeth, whose warm interest in Hungary was due to a large extent to him. In 1867 he returned to his native city and became editor-in-chief of the "Pester Lloyd," raising that paper to a high level of excellence. Falk has always been an active politician. Since 1869 he has been a member of the Hungarian House of Representatives. He is especially known in connection with the committee on foreign relations of the Hungarian delegation, and has been decorated by the Emperor Francis Joseph with the Komthur Cross of the Order of Saint Stephen. Pallas Nagy Lex., s. v.